Alaska has more than 40% of the nation’s surface water resources including over 12,000 rivers, 3 millions lakes greater than 5 acres and numerous creeks and ponds. Annual migrations of salmon up the Yukon and Kuskokwim bring ocean nutrients into the interior -enriching riparian zones and feeding eagles, bears, and wolves-and humans. Lush riparian areas are important to insect-eating songbirds in summer, and willow ptarmigan, snowshoe hare and moose in winter. Rivers also serve as travel corridors for both people and wildlife creating networks of water connections throughout the state. Rivers are an important component of Alaska's boreal forest ecosystem. They serve as travel corridors, provide habitat for fish and birds, and create unique riparian habitats for terrestrial animals. As rivers move across the landscape, they erode into the sediments along some sections of their banks, and deposit these sediments elsewhere. The resulting sand and gravel bars are colonized by herbaceous plants, willows, and deciduous trees. These lush riparian areas are important to many insect-eating songbirds in summer, and herbivores such as willow ptarmigan, snowshoe hare, and moose in winter. 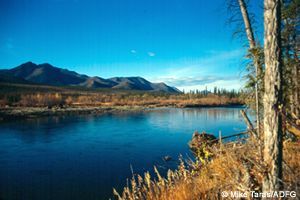 Alaska's major Interior river systems include the Yukon/Koyukuk and the Kuskokwim. These great rivers are fed by thousands of glacial and non-glacial tributaries, creating networks of water connections throughout the boreal forest. Annual migrations of salmon up the Yukon and Kuskokwim bring ocean nutrients into the boreal forest ecosystem-enriching riparian zones and feeding eagles, bears, and wolves-and humans.